It’s that time a year again! Everyone knows that when the season is about to change, you start to see all of your favorite stores fill up with seasonal goodies to inspire you. Yes, one of our favorite seasons is here! Bring on the Fall and all of the warm and fuzzy ways to decorate this year! 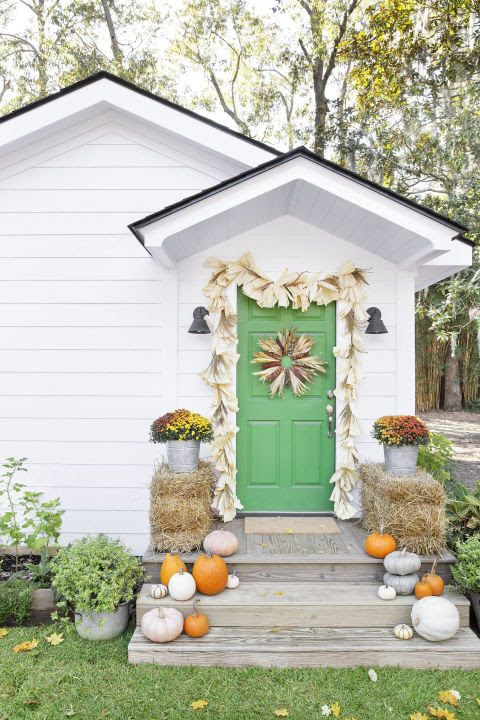 With that in mind, why not freshen up your fall décor this year with some wonderful porch ideas? Whether your style is classic, modern, or something more eclectic, there are many options to get creative with. We have so many ideas and so we thought it would be great to share some of them with you. We would also love to hear your ideas! 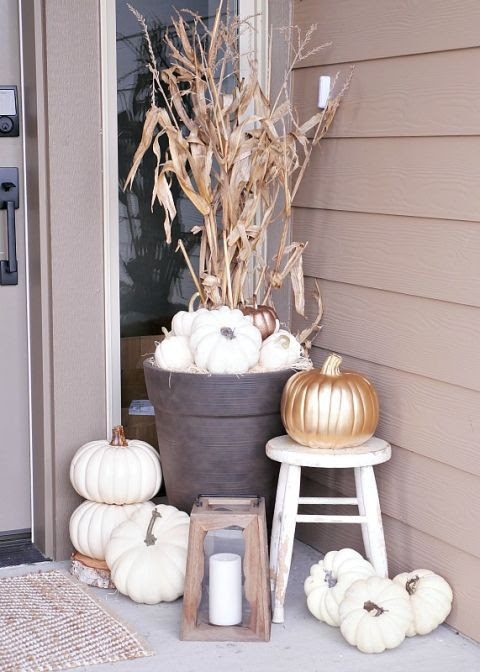 So, share your ideas with a comment on this post and let the Fall decorating begin! 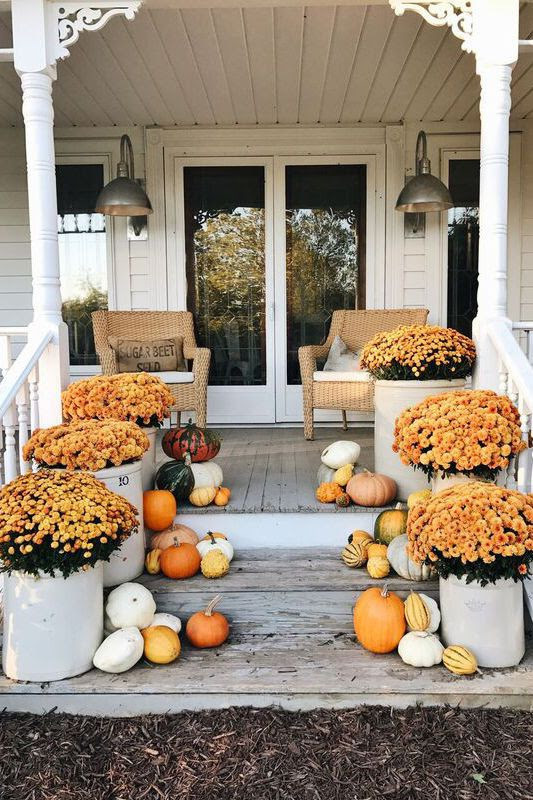 Visit your local flower shop or grocer and bring home some fresh flowers and lots of little gourds to welcome guests up the steps of your home. 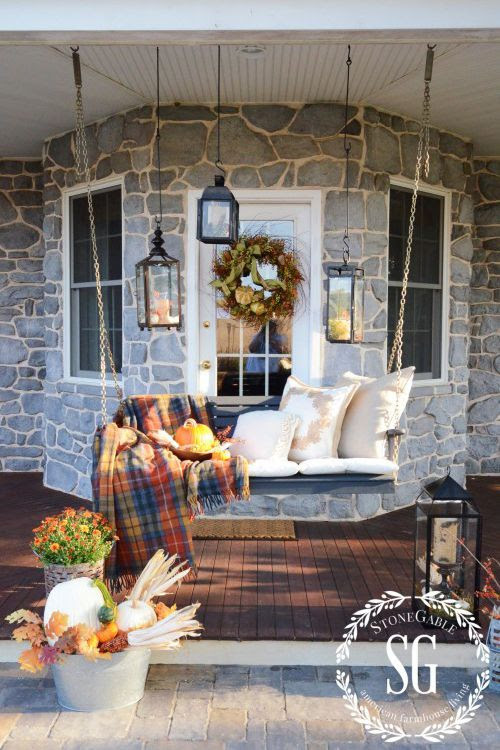 Plaid is a great way to cozy up your porch. 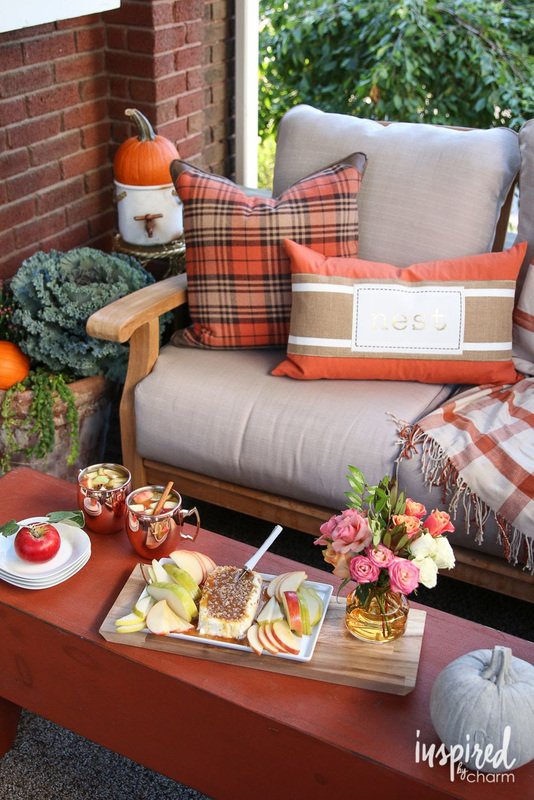 Add plaid pillows and accent pieces to your outdoor haven to create a warm and fuzzy feel! See more at Inspired by Charm. Decorating with corn husks is fun and can bring a whole new decor concept to Fall. You can get creative by planning DYI projects with your friends. We found this idea on Country Living and wanted to share. 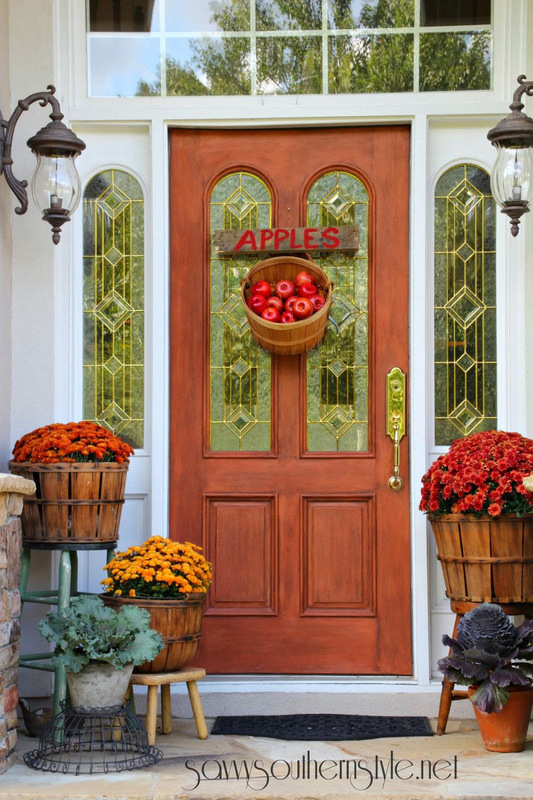 Add some serious seasonal curb appeal with these easy autumn DIY projects. For the wreath: Start with a flat-wire 18-inch frame. Hot-glue corn husks (roughly 18) and corncobs (roughly 9) in an alternating pattern. Fray the ends of the corn husks to add dimension. Who says you have to be traditional? This year, create a new look and concept by deciding on an eclectic and beautiful Fall wreath. Try something new and make your talents and creativity known to all of your friends and neighbors. See more at Savvy Southern Style. The chalkboard décor idea is both practical and fun. 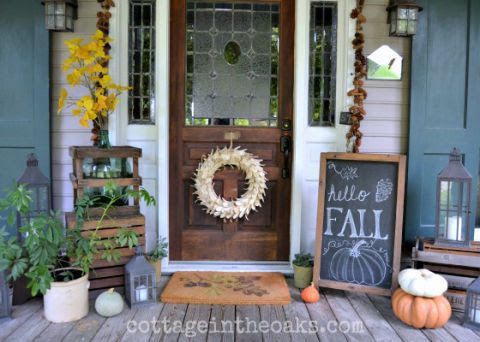 You can also use the chalkboard for other holidays and enjoy making new and creative signage for your front porch décor. Fall makes us feel cozy! It is all about the colors, flowers, pumpkins, gourds, and delicious fall smells. Why not collaborate them all to make a wonderful cozy porch seating area? Pick your favorite things and decorate to make it perfect for your liking. Who says that Fall has to be all orange and green and red? Fall can be any color you want. We love the white pumpkin and gourd look with accent pastel colors, metallics or contrasting dark brown or black colors. You can use spray paint to paint your pumpkins and gourds and create the look you want. See more at Taryn Whiteaker. Use other methods of decorating them and making them stand out. 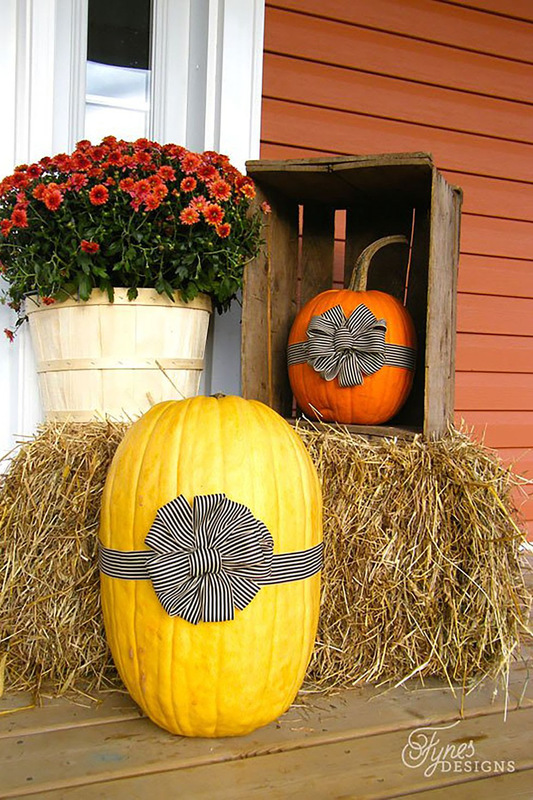 Visit your local fabric or craft store and pick out your favorite decorating ribbon and wrap your pumpkins to create a classy yet pretty Fall feeling. We hope you enjoyed some of these ideas. Fall is such an exciting season for everyone and we wanted to start it off by sharing something everyone is excited about!